Since the last loaves did not come out very airy, Matt suggested one option to try to improve that would be to increase hydration. The formula I was using used 68% water, so per the recommendation to increase, I raised that to 70% and 75% in today’s experiment. In both loaves I am using Los Gallos to keep that variable constant. 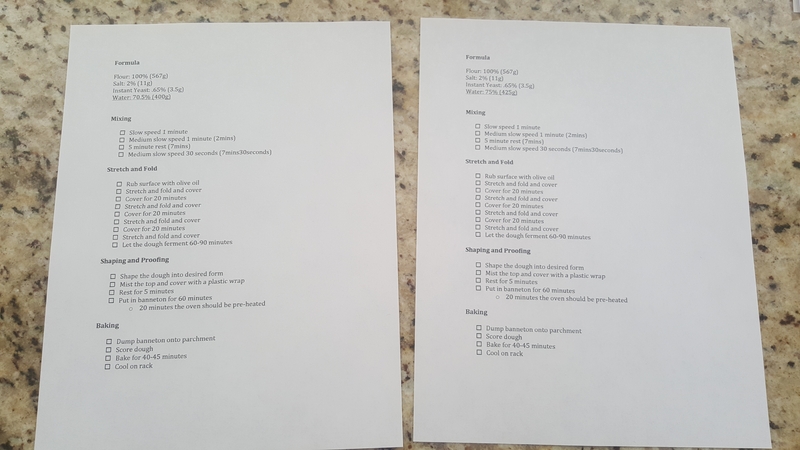 Also, I printed up a guide to follow and check off in hopes to reduce the amount of mistakes I make (since I am again making two loaves at a time with different formulas). The 70% mixed in the Kitchen Aid the same in appearance as the 68% formula, but the 75% did not ball up as the others. I suspect I should have mixed it longer, but since I wasn’t sure, I didn’t. This could prove to be problematic later. 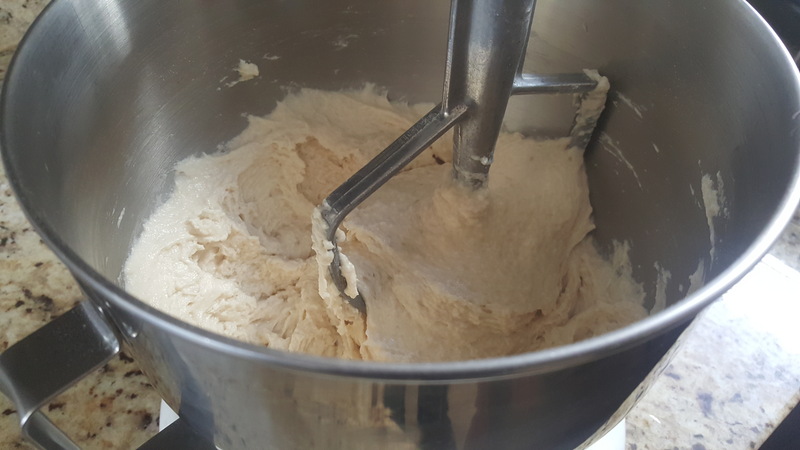 The 70% loaf when done mixing felt similar to the original 68% while stretching and folding, but not as tight when stretching. The 75% loaf felt significantly less tight. It felt so loose that it was hard to stretch and fold. It is a significant deviation from the feel of the original formula. Both of them felt really light. The 70% was sticky, but not so much that I thought it might be a problem for the banneton. That proved to be the case. 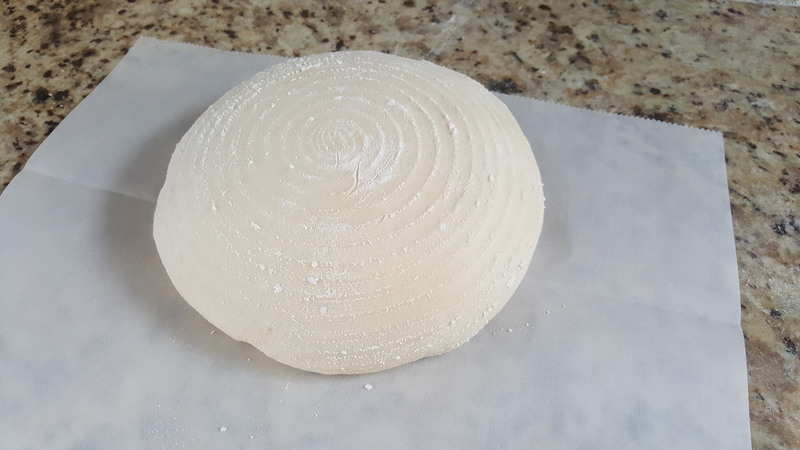 I should have taken a photo of my scoring, because after the dough is baked, it is always hideous. 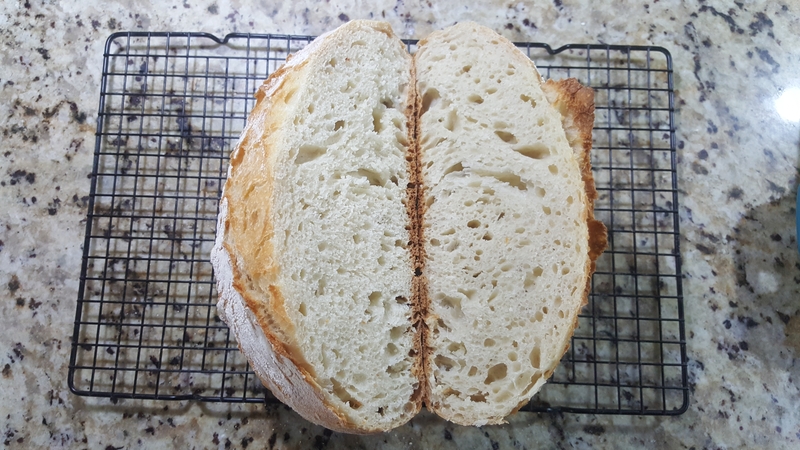 I don’t know what exactly I am doing wrong in that regard, but overall the loaf looked as good as it gets (to date) from what I have made. 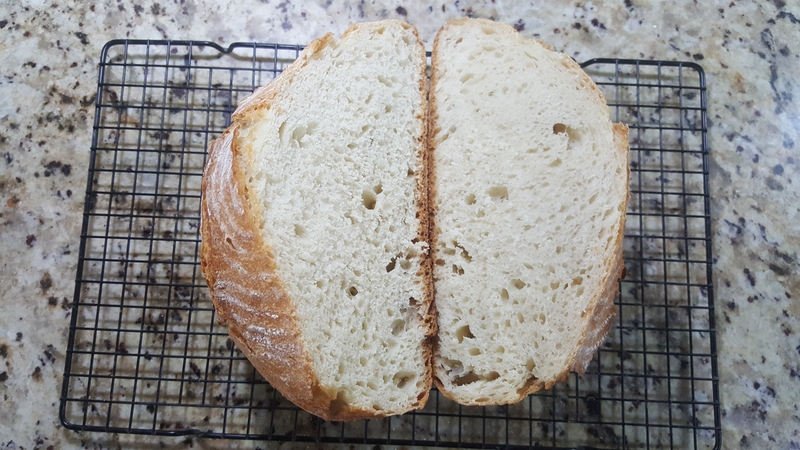 The poor looking shape in the photo above is probably due to the pre-bake shaping. Dana says I need to work on that to avoid weak spots. I wasn’t aware that was a thing. So that will be something to look into. Both of the loaves are more airy, but not enough. That might suggest the moisture was only one element among others. I’m not impressed with the 70, but the 75 looks pretty decent (although bigger holes would be nice). Both loaves are far too soft though. It seems like they should be much harder (at least on the outside). With the 75 you can see from the photo that I didn’t use the banneton as it doesn’t have those pretty lines. 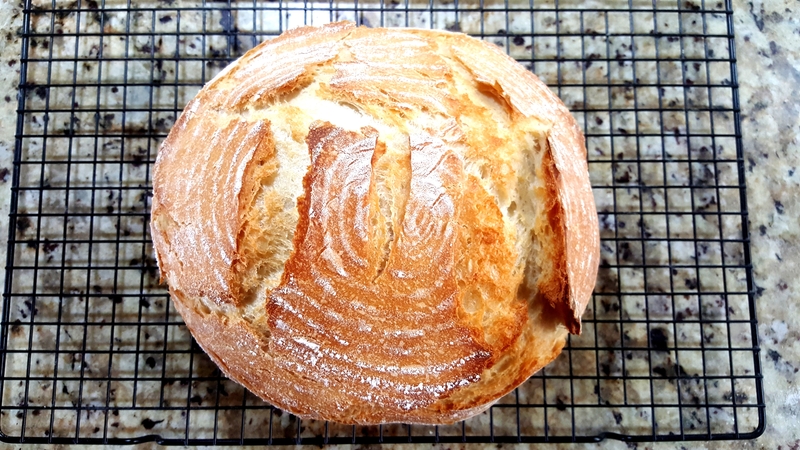 Instead, I used a cloth lined with flour (which is why you see so much flour). There was no sticking to the cloth and I think it would have been fine to have used the basket. It was much more difficult to shape though given how sticky it was and how loose and light. I desperately need a thermometer I can stick into the bread. I’m not entirely sure both breads were thoroughly cooked, but not knowing their temperature, I can’t say for sure. This would also provide a way to measure the temperature of the ingredients to ensure there are no deviations. Also, I need a thermometer for the oven. My suspicion is that it is not actually baking at 230 Celsius (which is the maximum for my oven), but rather lower than that. 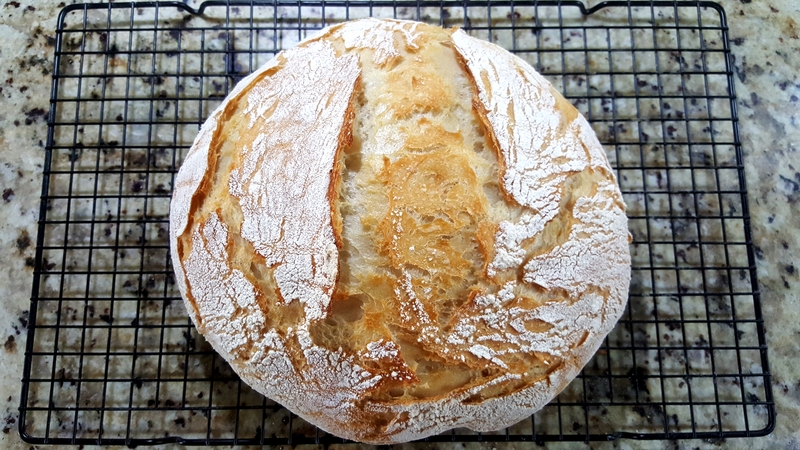 I baked both loaves for 45 minutes which should be much longer than necessary if it were truly 230.